Despite the fact that ‘Sophia’, a humanoid robot, was granted citizenship by Saudi Arabia and the growing fear and trepidation among retail and warehouse workers in the past decade, the integration of robotics and automation into warehouse processes is hardly the job “Robot Job Stealing Apocalypse” it has been made out to be. In fact, the expansion of robotics and warehouse automation is an indicator for an increase of retail warehouse jobs is likely, rather than a decrease. Let’s look at why robots won’t replace warehouse workers, and how they actually present further opportunities for growth across the industry. More than 3,600 closures are already on the list to shutter their brick and mortar locations in 2018 as shoppers favor sales and services online. This trend over the past decade may be a signal that ‘business is down’ which fuels the fears of retail workers about automation and robots taking over their jobs. If you look at the Occupational Outlook Handbook from the Bureau of Labor Statistics, the job outlook for the overall employment of retail sales workers is projected to grow 2 percent from 2016 to 2026, slower than the average for all occupations. Despite the low projected employment growth there should still be plenty of job opportunities over the next ten years since many workers leave this occupation each year. There will be an employment impact to cashiers as the Bureau of Labor Statistics projects little or no change from 2016 to 2026. Advances in technology, such as self-service checkout stands in retail stores and increasing online sales, will continue to limit the need for cashiers. Amazon thinks differently about the future of brick and mortar shopping experience and may be one of the reasons for these fears as they open a new Amazon Go retail business with no cashiers. However, as the demand for online order fulfillment increases (or demand in an automated store such as Amazon Go), so does the need for qualified warehouse workers to help fulfill orders correctly. While the job opportunities for cashiers has been impacted in recent years, the number of employment opportunities in warehouse and order fulfillment has been increasing exponentially. Retail workers are being presented with more opportunities than ever to make the transition from retail to warehouse fulfillment. On the surface, this period of transition can be frightening and cause a great deal of stress. In reality, the disruption within both the retail and warehouse industries will offer more employment opportunities and provide greater job security over the long term. Historically speaking, there have been many other instances of automation increasing job opportunities. For example, the banking industry underwent a similar transition with the advent of the Automated Teller Machine (ATM) back in the 1970s and 1980s. There was a great deal of fear and trepidation among bank employees that there would be significant employment losses due to the “replacement” of bank tellers with machines. During the 30 years following the introduction of ATMs, banks did see a 33 percent drop in overall number of employees per bank. On the other hand, due to their reduced operating costs, the banks were then able to open more locations and create more jobs. The fundamental truth of automation and robotics in the workplace is that it creates a shift in the type of job opportunities, but it does not historically reduce the overall jobs available. Nearly 500 years ago, Queen Elizabeth I revealed her fear of technology when she denied an English inventor named William Lee a patent for an automated knitting contraption. Though Queen Elizabeth I had feared for jobs when she denied Lee’s patent, weaving technology ended up creating more jobs for weavers. By the end of the 19th century, there were four times as many factory weavers as there had been in 1830, according James Bessen, the author of Learning by Doing: The Real Connection between Innovation, Wages, and Wealth. Each weaver could make more than 20 times the amount of cloth that she could have 100 years earlier. Despite what one might assume about integrated automation and robotics, warehouse workers get more done in less time thanks to devices like automated forklifts and carts doing the heavy lifting and moving for them. Workers no longer need to spend time moving between various picking bands to pack orders, and they can request products to complete an order vs wasting time walking back and forth. With this boost in efficiency, operating costs are reduced, and employers can invest in their businesses which improves growth… and employment opportunities. Many workers transitioning from retail to warehouse jobs report they have received a pay bump of nearly 31 percent on average compared to their prior pay in traditional retail roles. This increased spending on employees also provides other benefits such as higher education tuition assistance programs, health and wellness opportunities, and better schedules for employees to take advantage of these benefits. Contradictions about the future continue. In 2013, researchers at Oxford sparked fear of the robot revolution when they estimated that almost half of US occupations were likely to be automated. But three years later, McKinsey arrived at a very different number. After analyzing 830 occupations, it concluded that just 5% of them could be completely automated. Even with the dramatic increase in automation to help meet the fulfillment demand of e-commerce, warehouse hiring has not slowed down in the past three years and has in fact increased. Take for example e-commerce giant Amazon’s rapid increase in automation. In the past three years alone, Amazon has increased the number of warehouse robots and automated warehouse functions from 1,400 to 45,000. In that time, it has continued to increase its number of employees from 90,000 to 360,000 to meet the massive demand for its products and services. To summarize, automation increased the need for more workers in the warehouse as opposed to decreasing it. As order fulfillment increases, so does volume, even with a vast fleet of robots and wide array of other automated functions, Amazon knows they need people to continue operating at maximum efficiency. E-commerce is clearly here to stay, and as demand increases, so does the need for qualified warehouse workers to keep product shipments meeting the ever-increasing consumer demand. 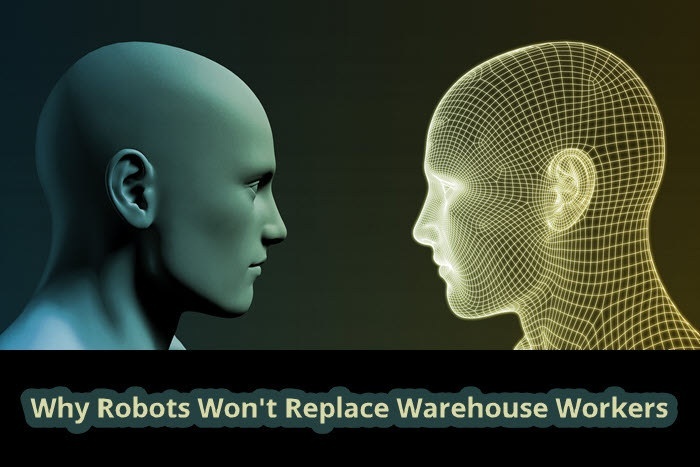 Overall, while automation in retail and some aspects of the warehouse industries is creating a shift in what jobs are available, robotics is in no way replacing warehouse workers any time soon. The demand for goods ordered online is only increasing, and automation and robotics are crucial to keeping up with consumption. Hiring continues to increase, and warehouses are busier than ever even with the increase in automated processes. Automation is the secure future, and robotics are a part of ensuring that warehouse workers can not only remain employed, but that they can meet the demands of an e-commerce driven world. Speaking of advanced technology, check out our award winning new product! 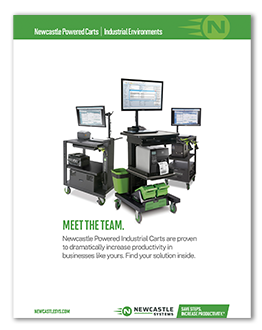 The Atlas Series Mobile Dimensioning Stations™ were designed to enable quick and accurate dimensioning directly at your product location. The rugged Atlas Series consists of 30” and 48” long workstations that hold and power the QubeVu DimStation™ and other hardware including scales, laptops/thin clients, and printers up to 12+ hours at a time or 24/7 operation.